It is always super fun to read what people loved and hated by the end of the year. 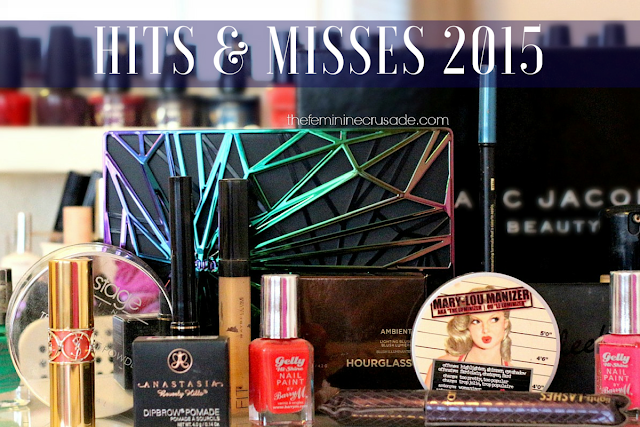 So, like every other year here are my Hits & Misses of 2015. Love the formula on this one! Beautifully dewy and so hydrating, this foundation is just what my skin needs. This powder is ideal for baking and setting. It does not look cakey, locks everything into place and helps control oiliness. I have been using this concealer for over 2 years now and do not feel the need to change. It provides me with the perfect coverage and blends nicely into the skin. I hate concealers that sit on top. The contour shade in this kit suits my complexion so well. It is the perfect cool-toned taupe with no shimmer and great pigmentation. Definitely check my detailed review where I gush all over it! The Hourglass Ambient range has the ultimate formula. This blush is just dreams, with its velvety finish, radiant glow and exquisite packaging. This was in my last year's hits and here it is again! I can never get over Mary-Lou Manizer. The champagne shade, the not-so-glittery formula is perfection. God the packaging here is pure love! I have never seen anything like it. And as for the shades, they are a perfect blend of colourful and neutral, shimmer and matte, with amazing pigmentation making this an all-rounder, money's worth eyeshadow palette. Nobody talks about this mascara much! But it changed the way my lashes look. For me, this is the only mascara that can give the false-lash effect; long, voluminous and black. Quite expensive but so worth it! If you are an eyeliner person, who loves precision and on-the-go application, this eyeliner is just what you need. It doesn't dry like the felt-tip eyeliners but gives the same control and preciseness as them. I don't think the Dip Brow Pomade even needs an introduction. Everybody uses it and everybody loves it. In short, it changed my brow game. If someone asks me what is your favourite lip product ever, my answer would be the YSL Rouge Volupte Lipsticks. They are just divine! And I am not only talking about the packaging. My perfect lip product needs to be super-pigmented, super-hydrating and moderately long-lasting; and the YSL Rouge Volupte ticks all three boxes. Can you believe I love the formula on these more than Zoya, OPI, Essie and the likes? Barry M says it is high shine and IT IS. The only nail polish that I wear without a top coat and looks perfect for a week. The super glossy finish is my favourite part about these. I rant all about these in my review, but what a waste of money, thankfully which was not much. I have never seen a more useless eyeshadow. It creases like hell! I was sucked into the the Etude House Dreaming Swan collection just because of the packaging. But I was disappointed with most of the products one of them being this eye and blush duo, which lacked badly in pigmentation. No matter how many applications I did, the colour never showed up. What products did you love/hate in 2015?